You’re just starting to make some dough and you should start stashing it away in a bank account. But if you’re currently bankless, you might wonder how to choose a bank for the first time. What should you consider? Where do you even start? With so many options out there, how do you cut through the noise? The good news is there’s no shortage of banking options out there. There really is something for everybody. The bad news is, it can be overwhelming to choose. As a young adult, it’s tempting to want to hop on whatever bank your parents have. But you’re part of a new generation and your dad’s bank may not fit your lifestyle or needs. 1. A retail bank. These are brick and mortar banks that typically have a variety of locations. Your “big banks” fall under this category and typically offer many financial products and services. These traditional retail banks may also have monthly maintenance fees, minimum fees, overdraft charges and ATM fees. 2. A credit union. Credit unions are like banks, but instead of being privately owned, they are non-profit organizations that are owned by their members. Credit unions offer many of the same products and services as banks, but they may be able to offer better rates. 3. An online bank. Online banks are financial institutions that don’t have any branches but offer banking capabilities via the Web and your smartphone. Because these online banks save money on physical locations, many of them have higher savings rates and lower fees than traditional banks. With any of these options, you will be able to get a checking account and you can also opt for a savings account. Fees. Many banks will have fees that you may not even be aware of, so read the fine print. As outlined above, retail banks commonly have fees and while these may seem minimal, they can add up. If you’re looking to save money, its best to look for banks with no fees. Accessibility. When it comes to managing your money, you want something that is easy for you. How easy is the setup process? Can you transfer money easily from a checking to a savings account? Does the bank have local branches in your area or can you access your account 24/7 online? Does the bank have online capabilities with a user-friendly website, as well as a mobile app? These are all things you should consider. Safety. Your money is a physical representation of your hard work, so you want to keep it safe, right? Check out reviews online about the banks you are considering and make sure they are backed by the Federal Deposit Insurance Corporation (FDIC). Under the FDIC, your balances are insured for up to $250,000. Transparency. Your bank is a big part of your financial life and you want to be able to trust your bank completely with your money. It’s important to look for banks that are transparent with how they make money and how they work to serve their customers. Several big banks in recent history have been under fire for slimy or fraudulent sales tactics, so be sure to do a bit of research on the bank’s history, reputation and business model. ATM access. If you need cash, will you be able to easily get some? You want to choose a bank that has ATMs in your area. If not, what are the ATM fees for using another bank’s cash machine? These fees can also add up, so be aware of how it can affect your bottom line. Support. If something goes wrong, how easy is it to get in touch with someone? Does the bank offer phone, email and social media support? You want to have a bank that has your back, no matter what happens. Banking isn’t — and shouldn’t be — what it used to. Technology has single-handedly revolutionized how we manage our money. And that’s a good thing. Banks used to be the only place where you could save, invest, or get a loan. But, with services like SoFi, Acorns, and others, you have more options than ever before. Today, you have so many choices that use technology to better handle your money. Why not look for banking options that give you a convenient and seamless experience? On top of looking for a bank that makes the process easy, you’ll want to choose a bank that fits in with your needs and lifestyle. Here’s a pro tip: choose a bank that offers perks to keep you on track with your financial goals. For example, at Chime, there are no monthly fees, overdraft fees, or minimum fees. Chime also has thousands of fee-free ATMs available for members and offers coverage for any unauthorized purchases. 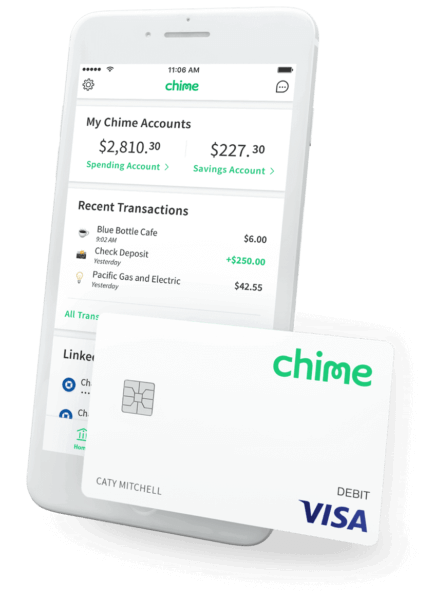 Most notably though, Chime empowers you to save money through its Automatic Savings program, which rounds up each transaction to the nearest dollar and transfers that money to your savings account. If you’re on a quest to figure out how to choose a bank for the first time, don’t fret. The perfect bank for your lifestyle is out there – waiting for you. Just remember: before picking a bank, read the fine print and make sure you have ultimate control over your money. Your bank should be your ally, not your next frenemy.